Environmental survival of antibiotic resistant organisms (AROs) such as Vancomycin resistant Enterococci (VRE), methicillin resistant Staphylococcus aureus (MRSA) and sporulating organisms such as Clostridium difficile has been suspected to play a role in nosocomial transmission of these pathogens [1, 2]. When patients are diagnosed with infections or as carriers of AROs, they are put on isolation precautions. For some pathogens (e.g. C. difficile) the housekeeping cleaning protocols are enhanced in an attempt to reduce the environmental load of these organisms . Reducing the environmental reservoir of these pathogens is thought to reduce the risk of cross-transmission between patients thereby reducing the risk of nosocomial infections caused by these organisms. The current PIDAC guidelines  recommend enhanced frequency of cleaning and that if ongoing transmission of C. difficile is documented during an outbreak of CDAD in healthcare facilities then 5000 ppm chlorine bleach should be considered for disinfection of the environment (particularly for toilet facilities used by patients with CDAD). However, as outlined by the recent review by Hota  it has been difficult to conclusively demonstrate that the presence of this organism in the environment has a causal role in the pathogenesis of nosocomial infections. One of the reasons for this is that the published studies that have evaluated potential interventions aimed at eradicating the ARO from the environmental reservoir were not able to verify compliance of housekeepers with the cleaning protocol. If the housekeeping personnel do not perform the cleaning properly then analysis of the efficacy of environmental interventions cannot be conclusive. 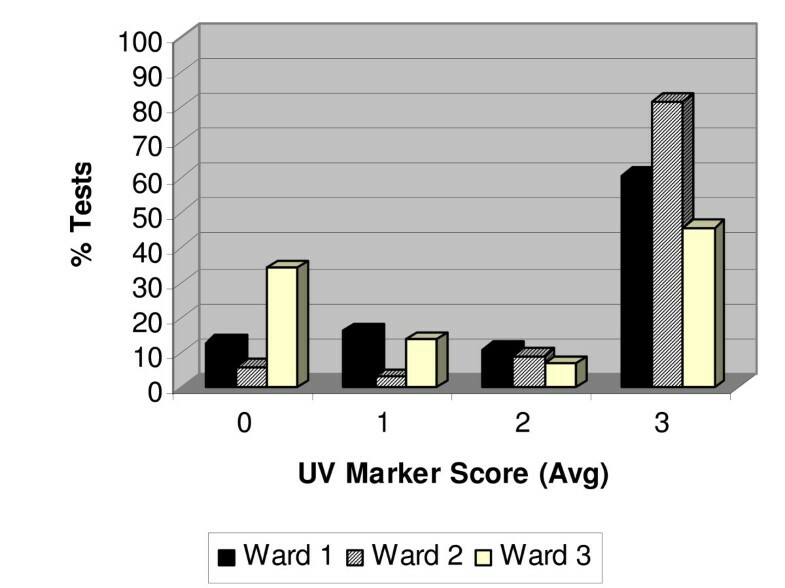 A recent study  used a UV-visible marker as a means of assessing environmental cleaning. They demonstrated the value of this tool in assessing compliance of housekeeping staff with terminal room cleaning. However, they only assessed whether the marker was removed after 2 to 3 patients had been in the room and it was terminally cleaned when these patients were discharged. There have been no published studies where cleaning was prospectively followed for individual patients. In North America, nosocomial infections due to C. difficile have a higher incidence than all other bacterial gastrointestinal pathogens combined (i.e. Salmonella species, Shigella species, Campylobacter species, Yersinia, E. coli O157:H7). Manitoba data for 2002 demonstrated that the combined number of all reported cases of the traditional bacterial gastrointestinal pathogens was 482 cases while there were 936 lab confirmed cases of CDAD for the same time period (data provided by Dr. G. Hammond as part of the "C. difficile Surveillance Project Symposium Oct 15, 2003"). In addition there is evidence that the incidence of CDAD in healthcare facilities in many different countries has been increasing over the past 10 years [5–13]. There have been many reports [14–17, 1, 2, 18] of C. difficile spores in the environment of patients who have C. difficile-associated disease (CDAD). The spores of this organism are known to survive in the environment for many months [16, 1, 19, 2, 20]. UV visible marker for verification of toilet cleaning. 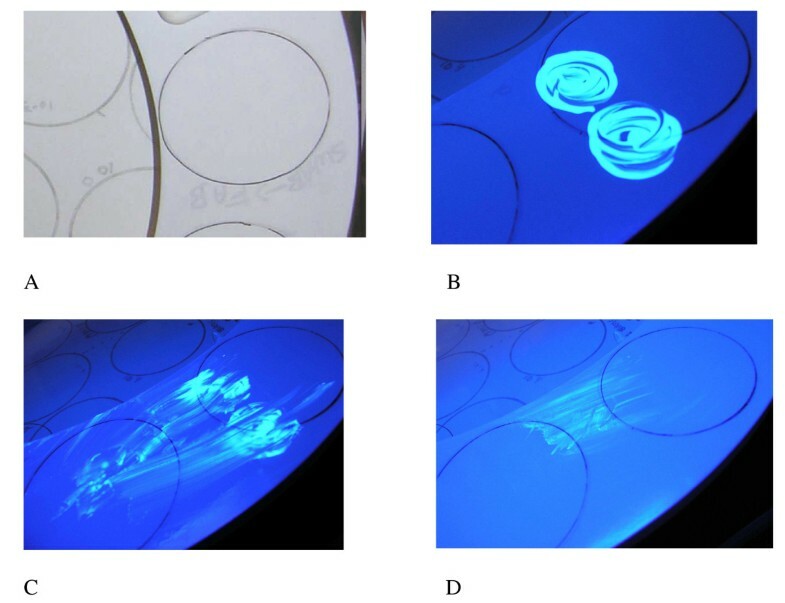 Toilet seat lids visualized with regular light (A), and with UV light (B, C, D). The UV marker is scored at 3; shows heavy residual UVM (B), 2; shows moderate residual UVM (C), 1 shows light residual UVM (D), and 0: shows no residual UVM (not shown). * Cleaning score: Visual inspection was used to assess how much of the UVM remained on the underside of the toilet seat as outlined in the Materials and Methods section. ** Toxigenic C. difficile detected: The Rodac culture plate contained at least one colony of C. difficile that was confirmed to be toxigenic (i.e. produced Toxin B mediated cytopathic effect using the tissue culture assay). *Patients with diarrhea where the diagnostic test for CDAD was positive and the patient was placed on isolation precautions with enhanced housekeeping (twice daily) using 0.05% SHP. ** Patients with diarrhea where the diagnostic test for CDAD was negative and once daily housekeeping was performed using 0.01% SHP. *** First sample taken before increased frequency of cleaning and use of higher concentration of SHP. Routine ward monitoring using the UVM. Ward 1 (14 rooms) is shown as the solid bar, ward 2 (11 rooms) is shown as the cross-hatched bar, and ward 3 (11 rooms) is shown as the white bar. The toilet in each room was monitored every day prospectively for a week (Monday to Friday). There were 66, 33 and 44 test samples taken from wards 1, 2 and 3, respectively. For ward 2 there was a STAT holiday and samples were not taken on that day so there were 33 samples instead of 44 samples in total. Wilcox et al  reported that using bleach for environmental disinfection of patient rooms did reduce the incidence of CDAD. As pointed out by Dettenkofer , Wilcox's data on the C. difficile spores in the environment demonstrated that spores persisted at similar levels regardless of which cleaning/disinfecting agent was used. Although Wilcox  documented reduced rates of CDAD this could not be sustained when the wards studied were switched over. These difficulties may well be linked to lack of compliance with the housekeeping protocol. It is impossible to conclusively determine the effect of any housekeeping cleaner/disinfector if the compliance of staff with the physical aspect of cleaning cannot be verified. Although there is some evidence that bleach [16, 17] or Accelerated Hydrogen Peroxide  can help contain nosocomial spread of CDAD these studies did not attempt to correlate the detection of spores in the environment with the reduction in cases of CDAD. Further studies are needed that use UVM (or some other validated means of assessing cleaning compliance) to correlate the presence of spores in the environment with an intervention using a specific cleaner/disinfector that has activity against C. difficile spores.